At least the tiles aren't an eyesore like last time. I'll give him that. @Hidoran. I played through a little, & there are bugs. Just... Bugs. And the tiles aren't an eyesore but the titlescreen is. 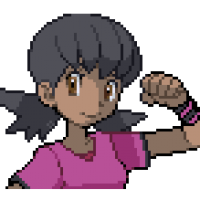 & Team Gunk's trainer sprites.